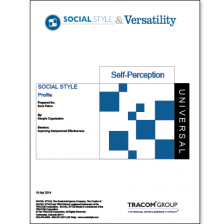 Although many products produced around Social Style by TRACOM are broken down into sub-categories such as versions for Managers and Sales people, one of the fundamental differences is that there are Self-Perception and Multi-Rater profiles. Only the Multi-Raters need certification to run and take feedback from peers, staff and managers to give a rounded 360 view of both your Social Style and Versatility. Although there is no right and wrong in terms of Social Style, there are “Good Levels” and “Areas to improve” when it comes to levels of versatility. Also how you see yourself may be different to how others view you, in more than 60% of cases, which makes for some interesting observations………..
People who think they are great ……………rarely are! People who are rated great by others ………often do not see themselves in the same light! 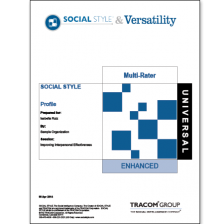 The Universal SOCIAL STYLE Multi-Rater Profile provides the most comprehensive picture of a person’s SOCIAL STYLE and Versatility. It uses an online, multi-rater questionnaire and provides the most detailed report including in-depth information on the four components of Versatility – Image, Presentation, Competence and Feedback. Purchase of additional TRACOM course, content or content license is required when purchasing this profile. Certification is also required when using a Multi-Rater Profile.